UFC fighters, Nick Diaz and partied the night away in celebration of the UFC 200 fight last night at Chateau Nightclub & Rooftop at Paris Las Vegas. 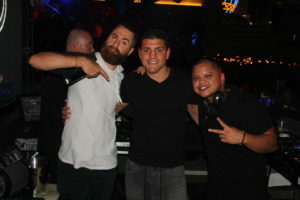 The athletes arrived at the club with a group of friends after the UFC bout to walk to the red carpet. Diaz sported grey jeans and a simple black v-neck t-shirt, while UFC 200 winner, Pena, opted for a white lace crop top, black printed skirt and completed the look with gold hoop earrings and gold bangles. The fighters mingled with the crowd and took photos with fans before making their way to a few of the club’s VIP booths where they partied with close friends for the rest of the night under the iconic Eiffel Tower. Diaz is the former Strikeforce Welterweight Champion and WEC Welterweight Champion, and can also be seen in the award winning MMA documentary “Fight Life,” released in 2013. Chateau Nightclub & Rooftop is located at Paris Las Vegas, 3655 Las Vegas Boulevard South, directly above HEXX kitchen │ bar │ chocolate. The nightclub is open Wednesday, Friday and Saturday nights from 10:30 p.m. to close. Chateau’s industry night, Chateau Wednesdays, offers complimentary admission to locals with ID on Wednesday nights. Free cover for locals, excluding special events, general admission starts at $20 for ladies and $30 for gentlemen. Dress code is strictly enforced. For table reservations and VIP bottle service, call 702.776.7777 or email reservations@chateaunightclublv.com. For general information and updates, call 702.776.7770, become a fan on Facebook or follow us on Twitter www.twitter.com/chateaulv. Paris Las Vegas brings the passion and sophistication of the City of Light to the heart of the Las Vegas Strip, transporting guests to Europe’s most romantic city. Distinctive for its dramatic 50-story replica Eiffel Tower and authentic architectural reproductions, Paris Las Vegas was awarded “Best Architecture” by the readers of the Las Vegas Review-Journaland features more than 2,900 hotel rooms and suites, an 85,000 square-foot casino, the two-acre Soliel Pool, Paris Spa by Mandara, two wedding chapels, unique French retail shopping located along the resort’s Le Boulevard District, and the opulent nightlife venue Chateau Nightclub & Rooftop. Eleven restaurants include a distinctive array of fine cuisine such as Chef Joho’s acclaimed Eiffel Tower Restaurant, French-bistro Mon Ami Gabi, Steve Martorano’s signature Italian-American dishes at Martorano’s and internationally-renowned Gordon Ramsay Steak. Performing in the 1,477-seat Paris Théâtre is the award-winning musical Jersey Boys. For more information, please visit www.parislasvegas.com. Find Paris Las Vegas on Facebook and follow on Twitter.